On November 2, Meb Keflezighi will try to become the first American in more than 30 years to win the Boston Marathon and the New York City Marathon in the same year. Keflezighi won the Boston Marathon earlier in the year with a 2:08:37 time, shocking many as several of his competitors have averaged faster times on marathons. In a profile from Matthew Futterman of the Wall Street Journal, Futterman takes us through several days of the 39-year-old Keflezighi’s training. He does altitude training before major marathons. Some days he does high-speed mile circuits. 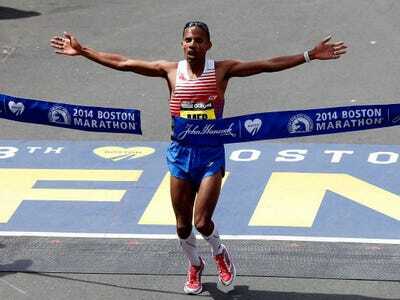 On one particular day, Futterman says Keflezighi ran eight one-mile circuits, the fastest at 4:32, the slowest at 4:49. He rested 2 1/2 minutes in between each mile. These are usually longer in distance, and he does them at race speed. He does warm-ups and cool-downs before and after his workouts, varying in length. According to Futterman, one day Kelfezighi warmed up with a one-mile run at seven-minute pace. On another day, he cooled down with a three-mile run at a seven-minute pace. Many marathon runners will total 150 miles over the course of their weeks while training. Keflezighi avoids that, claiming the most he ever ran in one week was 136 miles — at altitude — while training for the 2004 Olympics. He chooses running surfaces that are easier on his body. He runs on grass or dirt whenever possible to avoid hurting his joints on hard surfaces like concrete. He incoporates other types of cardio training. Keflezighi claims that riding an elliptical bike is similar to the motion of running, but also avoids overtaxing his joints. Some afternoons he’ll ride for 90 to 120 minutes. His recovery is just as important as his running. Like many athletes, Keflezighi ices down after his runs. He also will go for massages or use more advanced therapy, like plastic boots with pulsating air that improve his circulation.